All The Things... was a promotional only cassette release by Virgin Canada to promote the Canadian leg of the Once Upon A Time tour. 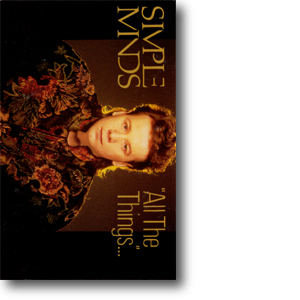 It was intended as an introduction to Simple Minds and their music, its contents a sampling of the band’s work to date. Its artwork and title was inspired by the All The Things She Said single which had been released a couple of months earlier. It served as a handy introduction to Simple Minds' catalogue and included key tracks from all their previous albums. The cassette inlay featured full album track listings and catalogue numbers. The track listing on the back of the cassette sleeve was incorrect: whilst it showed Don’t You (Forget About Me) chronologically in its rightful place (between Sparkle In The Rain and Once Upon A Time tracks), the song actually closes the album.